an exciting interactive format make grammar practice fun. 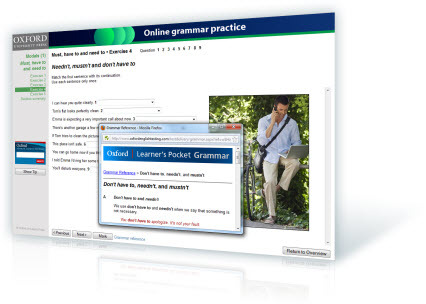 Online grammar practice is based on John Eastwood’s Oxford Learner’s Grammar Builder. It is suitable for Intermediate (B1) to Advanced (C1) students. It allows you to choose the areas your students need more practice in, and is available in four individual packs or all four packs together with a 10% discount. You manage your students' practice using a Learning Management System (LMS), assigning the units when students are ready for it, tracking their progress and seeing their marks in the online Markbook. You can allow students to practise with or without the learning support. You assign one or more units to your class. You see the marks in the online Markbook. Can teachers do a free trial? Yes, you can do a 90 day free trial of some sample grammar practice. You'll have full access to the LMS, and you'll be able to assign it to your students. Find out more and sign up. Can students buy their own grammar practice? Yes, students can buy the same Packs and do the practice at home without teacher involvement.